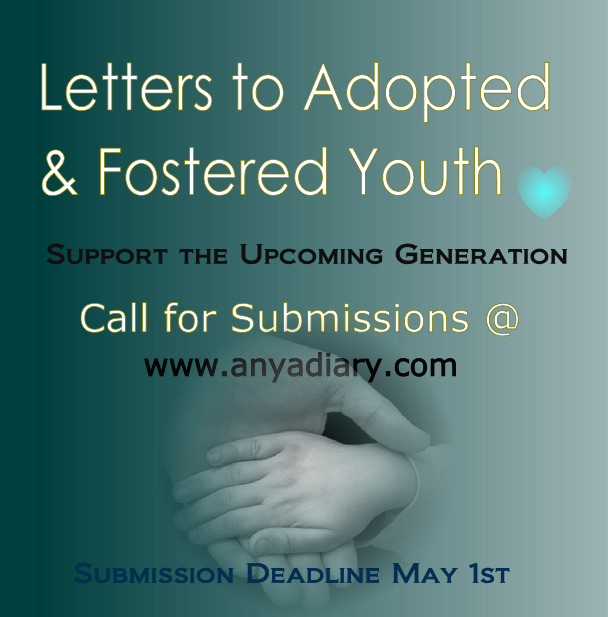 We want to thank everyone for their outpouring of support and enthusiasm for Dear Wonderful You, Letters to Adopted & Fostered Youth. We are humbled and grateful for the tremendous submissions we have already received. Several writers have expressed the emotional journey they took during the writing of their submissions. We want to thank all of those who have forged ahead and submitted to the project. We also have received many private requests to extend the submission deadline because contributing to this project does require a personal and complex journey. For those adult adoptees and adults who were fostered, we want to extend the deadline to make sure everyone who believes in this project has the chance to contribute. We also want to assure you –every submitted letter we receive is read with deep care and held with respect. Thank you to all who have contributed their submissions. Thank you in advance to those who will join us in these upcoming weeks with their submissions. We promise you will be in wonderful company. Your unique words have the power to make a difference.